How can we say it’s the best? 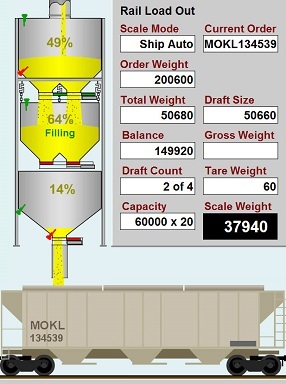 Lowest height: We are able to reduce the overall height of the sampler because we supply both the bulk weighing scale above the sampler and the spout below, and are able to eliminate the transition pieces. For example our 20,000 BPH sampler is only 39″ tall and our 60,000 BPH is only 51″. Compare this to competitive products that are in excess of 84″. This saving in height can be used to provide additional upper garner capacity or to reduce the overall height of the system. Full Integration: Because our scale system knows which rail car is being loaded we can print out a grade slip so that the inspector can drop it into the sample. Stainless Steel: While competitive systems are made of painted mild steel, our system is all stainless steel, ensuring a long trouble-free life. Installation Options: Samplers can be placed in a vertical position, or for non-FGIS applications at an incline below or above the scale. Flexible Power: Samplers can be powered by the scale hydraulic or pneumatic system, or by 110 VAC. Fully Approved System: The sampler is fully approved by all the legislative bodies, including USDA, Canadian, FGIS and NOPA (National Oilseed Processors Association). 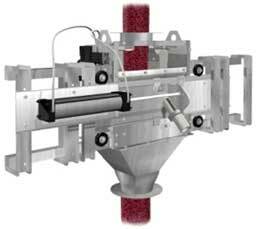 Description: The model G Automatic Sampler is a versatile cross-cut sampler designed for free-flowing products. Products range from granules, powders, flakes, pellets and slurries. Operation: It has an adjustable rate of travel. The ‘pelican-type’ head traverses across the flow on an arc to collect a sample. The sample flows through a flexible tube to a secondary sampling system. Sealed Sampler housing fabricated from 12 gauge 304 stainless steel plate with square flanged inlet and outlet openings to match customer’ chute. Gasketed inspection door and bolted panels to facilitate maintenance. Pivoted sampler cutter pelican with 50 degree slope, 2″ or 3″ diameter discharge, ¾” effective width cutter opening, hardened replaceable pelican lips, upper and lower support bearings. Replaceable foam backed neoprene pelican seals. Industrial hydraulic cylinder with 4-way solenoid valve filter, pressure regulator and gauge. Standard automatic controller supplied with a NEMA 4X dust tight and watertight non-metallic enclosure with digital timer (110V / 1 Ph / 50 Hz or 120V / 1 Ph / 60 Hz). Controller to run both the model G and model SC. 20 ft. of sample hose, wall bracket and 2 qt. P.E.T. sample container or bag. Sampler housing fabricated from 16 gauge No. 304 stainless steel plate with 2″ or 3″ diameter inlet and outlet connections. Adjustable stroke pendulum material diverter fabricated from 12 gauge No. 304 stainless steel with horizontal support shaft and sealed bearings. Single fixed sample cutter pelican with adjustable width aperture and 2″ or 3″ diameter sampler discharge. Pendulum drive including 1/6 Hp T.E.F.C. gear motor.